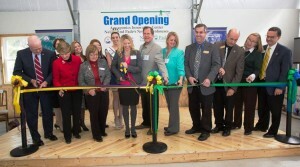 On April 23, 24, 25, we celebrated the Grand Opening of our new greenhouse facilities as well as the University of Wisconsin-Stevens Point’s Aquaponics Innovation Center. We appreciate the excellent media coverage for the events. John Pade, Nelson and Pade, Inc. The University of Wisconsin-Stevens Point and Nelson and Pade, Inc. have partnered together to create the Aquaponics Innovation Center, the nation’s largest aquaponics research facility, which will provide a source of education and resources for economic and workforce development. The Aquaponics Innovation Center is housed within Nelson and Pade, Inc. state-of-the-art controlled-environment greenhouse. Included in the 4,800 square feet of the Aquaponics Innovation Center is six aquaponic fish and soil-less plant production systems that will be used to conduct and replicate research benefiting the industry. Together, University of Wisconsin-Stevens Point Professor of Fisheries Biology Dr. Christopher Hartleb and Co-Founders Rebecca Nelson and John Pade, have developed the first-of-its-kind, University Aquaponics Course. International entrée’s featuring aquaponically grown fish and vegetables. Guests enjoyed a catered meal featuring aquaponically grown produce and tilapia from Nelson and Pade’s greenhouse, as well as Atlantic salmon and hybrid walleye from the University of Wisconsin-Stevens Point Northern Aquaculture Demonstration Facility. Entrees included: Fish Tacos (tilapia), English Fish and Chips (tilapia and hybrid walleye), Aquaponically-grown Salad (romaine, bib and leaf lettuce, swiss chard, kale, basil, beefsteak and blush tomatoes, cucumbers and nasturtium flower), Spanish Paella (tilapia and salmon), and Moroccan Tagine (tilapia and salmon). The Grand Opening festivities continued on Friday in a form more similar to that of a reunion. Nelson and Pade growers, customers, and past workshop attendees were given their own day for viewing the environmentally controlled greenhouses and Clear Flow Aquaponic Systems®. The estimated 200 hundred attendants also enjoyed the world seafood menu, while updating the Nelson and Pade team on their aquaponic farm’s progress and projects. Capping off the event on Saturday was an open house for the community. It was an introduction to aquaponics and controlled environment agriculture for the majority of the 500+ visitors that toured the greenhouses. Children took home fish toys and novelties from several activities and games, as parents left wide eyed with a new understanding of the future of sustainable agriculture.